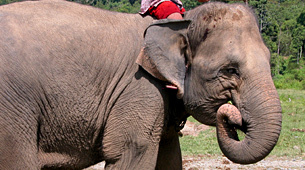 The care and welfare of Sumatra’s captive elephants residing in Elephant Conservation Centers (ECC) is a high priority and the need for improved veterinary care has been consistently cited as a major concern. The IEF is providing support in the development of a program, which places all of the ECCs under an umbrella Elephant Resource Center (ERC). The ERC will be administered by Indonesians, under the auspices of independent NGO’s supported by international donors. The ERC will document and improve the health status of Sumatran elephants and prevent unnecessary deaths due to malfeasance, ignorance, or lack of material and technical support. Material support and appropriate training will improve the status and motivation of veterinary and husbandry staff while the identification and training of key Indonesian personnel who can liaison between the Elephant Conservation Centers, central government officials, and the international community will provide an effective vehicle to systematically address the on-going problems of the ECCs.